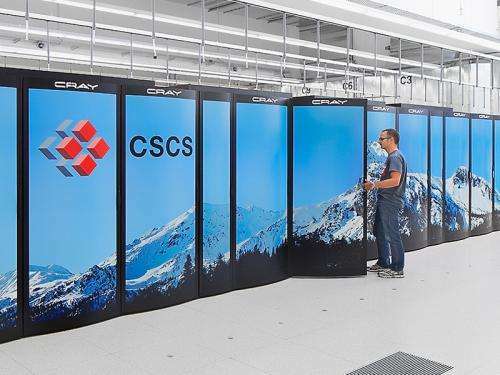 With "Piz Daint" the Swiss National Supercomputing Centre (CSCS) is putting a new supercomputer system in operation that will provide the necessary compute performance and consume less power. This is made possible by a novel hybrid computer system which makes use of sophisticated graphics processors (GPUs) as used in the gaming industry. The supercomputer "Piz Daint", which has been in operation at the national supercomputing centre (CSCS) since April, is presently being extended with graphic processing units (GPU) from processor manufacturer NVIDIA. In this extension, one of two conventional processor (CPU) located on a compute node is being replaced by a GPU. Compared to a conventional CPU, the GPU has reduced functionalities that are optimized for numerical calculations. In simple terms, this enables the GPU to compute much faster, while saving energy. Furthermore, the new supercomputer gets much of its overall performance and efficiency from a novel interconnecting network between compute nodes that has been designed by computer manufacturer Cray. It is the first of its kind, and has been designed to help researchers solve more detailed, higher-resolution models – and this all while consuming less power. "Given the ever growing demands of computer models, we can only contain energy consumption in supercomputing with a radical change in computer architecture," says Thomas Schulthess, Director of CSCS, with conviction. The benefit of this new system should go primarily to climate scientists, geoscientists, chemists, as well as materials and nano-scientist with their complex computations, but also physicists and biologist who run ever more compute-intensive applications at CSCS. According to Schulthess, initial tests revealed that a climate simulation on Piz Daint runs over three times faster and reaching the solution with seven times less energy consumed as compared to CSCS' current flagship supercomputing system "Monte Rosa". The latter runs with conventional CPUs that have been upgraded less than two years ago. Even compared to the exclusively CPU processors previously available in "Piz Daint", the hybrid system with the GPU processors is expected to run almost three times more energy-efficiently than with CPUs only. Thomas Schulthess sees an opportunity to build energy-efficient, high-performance computing systems with GPU processors, which stem from the computer game and graphics industry. Since they serve as a kind of accelerator for the computation, they have been used in the past to boost systems in the race for the fastest supercomputer worldwide. According to Schulthess, the accelerator processors often remain unused in real simulations, because they could not be effectively used with the legacy computer codes and algorithms. But this has changed, as several computing centres have now implemented them successfully in their supercomputers. In Switzerland, under the HP2C Initiative launched within the scope of the national high-performance computing and networking strategy (HPCN Strategy), researchers have developed specific algorithms in the last three years. Thomas Schulthess collaborated with supercomputer manufacturer Cray to include NVIDIA GPUs in its new generation of computer systems. "Piz Daint" is the result of this effort. Oliver Fuhrer, a senior scientist at MeteoSwiss who played an active role in the co-development of the new climate and weather simulation codes, has high hopes for the new hybrid architecture. While MeteoSwiss currently runs weather simulations on its own CPU-based supercomputer at CSCS, the same weather forecasting simulations have been running in parallel on a GPU-based prototype since the spring. Despite being a much smaller computer, the GPU system takes only fifty per cent longer than the official MeteoSwiss supercomputer and the energy consumption was reduced by a factor eight. "Our goal is to increase the resolution for our weather forecasts and run our simulations several times in order to better quantify the uncertainty of our weather forecasts," says Fuhrer. With collection of simulations in which initial and boundary conditions are varied slightly, Fuhrer says the risk of heavy storms, like the one that disrupted Bienne's Gymnastics Festival this year in June, could be detected even earlier, allowing authorities to take appropriate measures sooner and more effectively. Calculating such so-called ensemble weather forecasts with a high spatial resolution is too expensive on today's CPU-based systems. Using a GPU-equipped computer, however, the costs would remain reasonable, the scientist from MeteoSwiss is convinced.